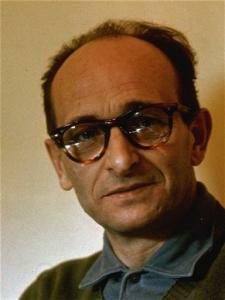 Was Adolf Eichmann kidnapped by Mossad for his involvement in the Holocaust? It seems that German tax money was used to build Dimona and that German scientists helped the Israelis obtain the atomic bomb. Did Eichmann play a role in this? Argentinean whereabouts of Eichmann were known to the BND and the CIA at the beginning of the 50s, with Mossad no doubt also informed. First of all, Adolf Eichmann is quite plain throughout these papers that the word Endl�sung, or "final solution," meant only one thing to him, and that was Madagascar. When he addressed his mind to the "final solution of the Jewish problem" in the late 1930s and early 1940s, it was quite plain to him that it was only a plan to sweep all the Jews of Europe aboard boats and transport them lock, stock, and barrel down to Madagascar, where they would be on an island where they couldn't bother any of their neighbors and where none of their neighbors could bother them. I've always said and I say it here again -- even though I risk making a few enemies -- that I think that would have been an ideal solution to a perennial world tragedy. Eichmann's comments on the H�ss memoirs are annihilating. Reading where Rudolf H�ss is saying that two and a half million Jews have been liquidated at Auschwitz, the camp where he was commandant, Eichmann comments, "Where does H�ss believe that he got these two and a half million Jews? Not from me. Because to have liquidated two and a half million decrepit, elderly, unworkable Jews, I must have had to feed to him three, four, five, six or seven million Jews in that space of time, and from the transport point of view alone this would have been totally impossible." Eichmann inspected Auschwitz. He went to Auschwitz several times, as he recounts in his memoirs. He describes being met by Rudolf H�ss, the commandant, and he describes several grisly scenes. He describes going past an open pit where bodies were being burned, and he says it was an infernal sight, the likes of which he would never forget. He describes how the commandant, H�ss, tells him that they are doing these things on Himmler's orders and that it is a sacred task that has been imposed on the SS. He doesn't try to avoid describing what he's seen. He describes the pits in Auschwitz, he describes the crematoria, just the same as Albert Hoffmann. Four or five years ago, while going through the records of the National Archives in Suitland, Maryland, I came across the interrogation report of Albert Hoffmann, who was the deputy Gauleiter of Silesia, the Gau where Auschwitz was situated. I thought he was an unimportant man, because I didn't realize he was in Silesia, but the British, interrogating Hoffmann, asked him if he'd ever visited a concentration camp. Hoffmann's reply was, "Yes, I've visited two concentration camps in my life, one at Dachau in 1936, which was organized, clean, decent and disciplined, and the prisoners were well fed. Then again," he said, "in 1941 (or 1942: I think, in fact, in both years), I visited Auschwitz concentration camp with my Gauleiter, Bracht, and with the Reichsf�hrer SS, Heinrich Himmler." Eichmann's memoirs are an important element of the refutation of the Holocaust story. I have saved this for the end: Because I'm notorious, and because my name is on stickers around London, ("Irving speaks and Rostock burns"), purely by chance another man came and visited me in London only a few weeks ago, and he unwrapped an envelope, and inside the envelope was a book. I recognized it because it's a well-known book that we all have consulted. It was a copy of the original German edition of the memoirs of Rudolf H�ss, Kommandant in Auschwitz , published in 1958 by the Institute of Contemporary History in Munich. Here are some pages of it, and you can see the handwriting -- it's got hand-written marginal notes all over it. 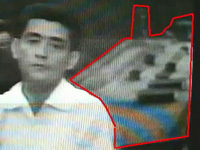 Says one note here, "That is a lying distortion of the facts." The handwriting is Eichmann's. 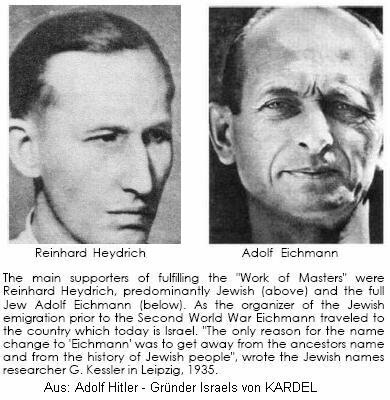 The book is Adolf Eichmann's own copy of the Rudolf H�ss memoirs! I don't know how much money this man wanted for it. I'm not a rich man, but I've got his address; one day, perhaps, I'll make him an offer for it.